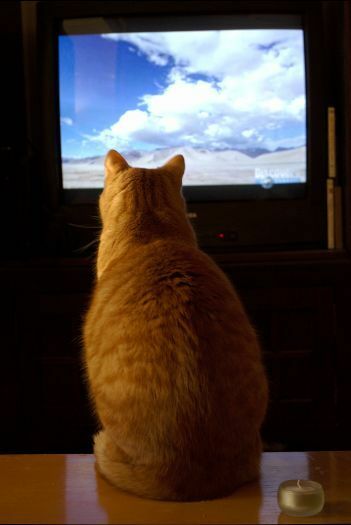 I'm not the only one who loves Discovery's Planet Earth. Sometimes he stands directly in front of and at the foot of the TV. I keep telling him it’s not good to sit so close but he never listens. He loves this show and it cracks me up that he actually watches it. Next Post A Million and One Thank Yous. 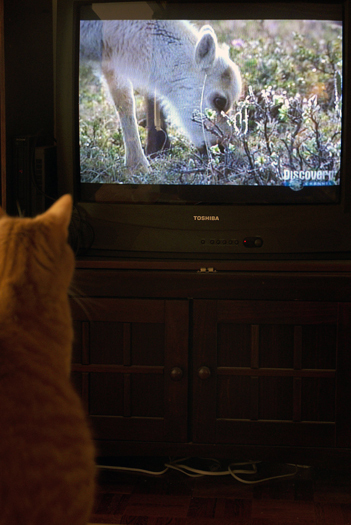 Dub was watching some cutest puppies show on Animal Planet last night. Orange cats are weird, but so very awesome. I want a big fat friendly cat. We just have this pathetic little grey barn cat we adopted who only emerges from the basement to harrass us for more food and hiss at us (except Kerry, whom Gracie adores). Charlie, say no more, Tucker is yours. Well, if you ever have to give him up for some reason, we’ll adopt him. I’ve always had a secret sympathy for the Orangemani cause, even if their methods are occasionally extreme.